Happy Monday and welcome to another edition of Monday’s Music! I know it’s been a while since the last Monday’s Music (almost three months, yikes!) and I know I ALWAYS say I’m going to do more Monday’s Music Playlists but I promise I DO plan on turning this back into a biweekly feature again (because I really do LOVE coming up with themed playlists!). 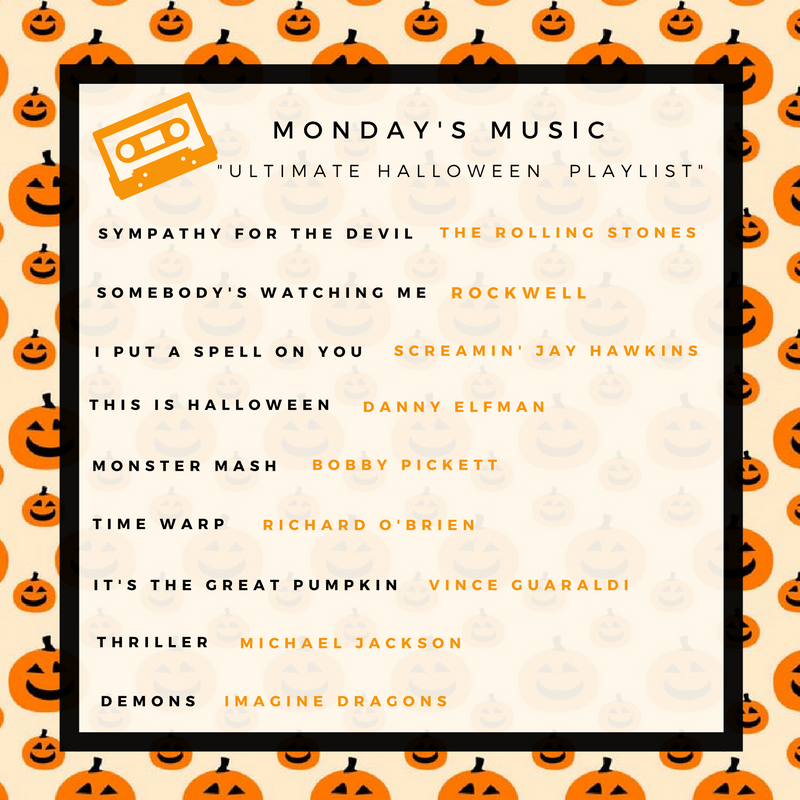 Since Halloween is exactly three weeks away, I thought it would be fun to share my “Ultimate Halloween Playlist!” This “Ultimate Halloween Playlist” consists of the nine songs that never fail to remind me of Halloween. • Somebody’s Watching Me. This music video used to freak me out when I was a kid! • I Put A Spell on You. I can’t hear this song and NOT think of Hocus Pocus and I can’t think of Hocus Pocus and NOT think about Halloween! Seriously, Hocus Pocus is without a doubt one of the best Halloween movies ever! • This is Halloween. Along with Hocus Pocus, The Nightmare Before Christmas is hands down my favorite Halloween film. Although the ENTIRE soundtrack is amazing, “This is Halloween”, more than any other NBC song, really gets me excited for Halloween time! • Monster Mash. No Halloween Playlist is complete without “Monster Mash!” I have honestly NEVER been to a Halloween party (including nightclub Halloween bashes) where this song wasn’t played at least once. • It’s the Great Pumpkin, Charlie Brown. So this is technically a soundtrack, not a song, BUT it stills reminds me of Halloween nonetheless. • Demons. Okay, I know this isn’t a “Halloween” song but for some odd reason, I always think of Halloween/fall time when I hear it. What’s your favorite Halloween song?